Every once in a while comes a pattern that's so crazy unique and different that it blows people's minds. ladies & gentlemen, I'd like to introduce to you the first such pattern to blow my (and your) mind this year! 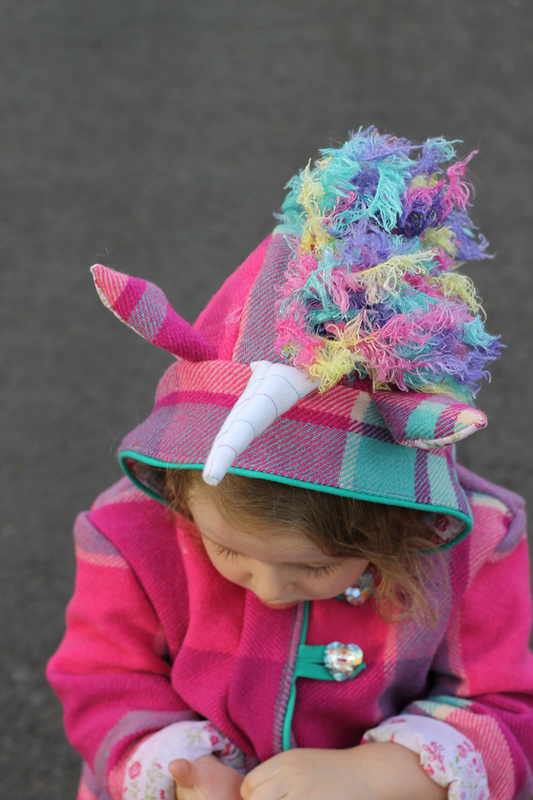 The Wild Things Coat is the newest pattern by Big Little, a new-to-me pattern company that I've fallen head over heels with. It's not just the patterns, it's the woman behind the patterns who I admire and respect and who is totally talented. 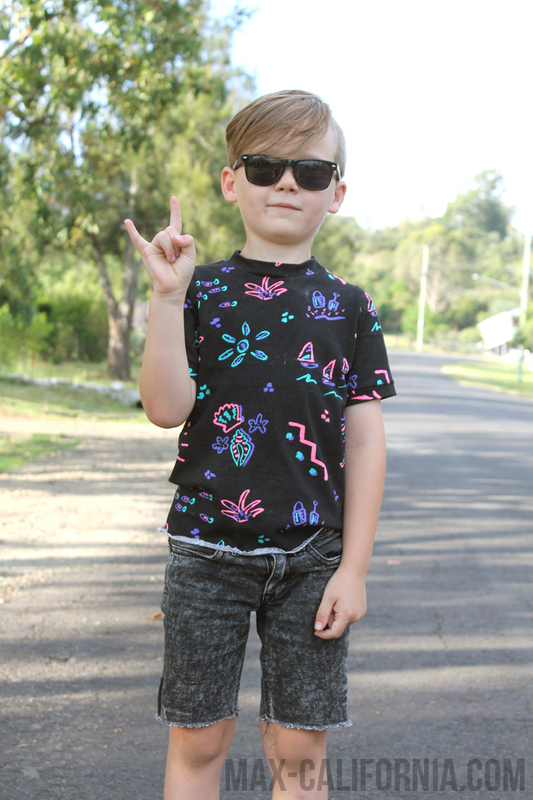 I signed up for testing TWO coats, this one and one for Vincent, and while sewing with blankets and stitching up thick winter coats for my babes in the middle of this hot hot Australian summer made me feel like a crazy person it was still A LOT of fun. 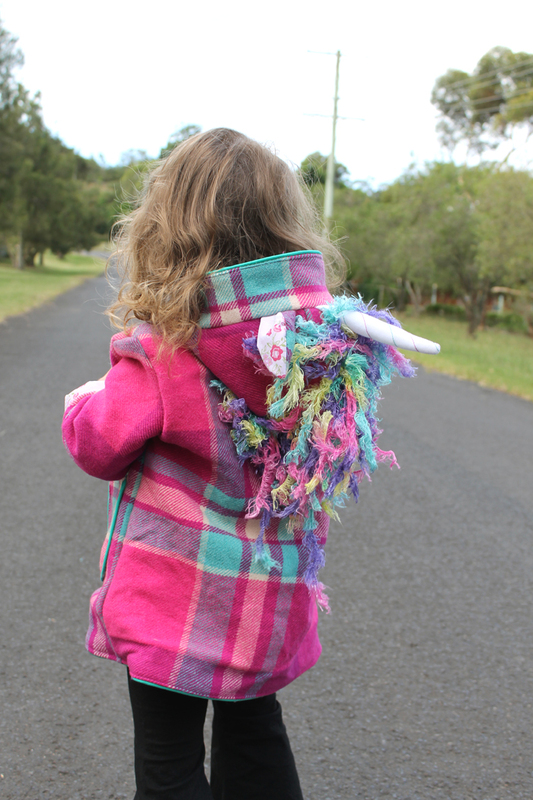 Eddie's unicorn coat was made from a pink wool blanket and lined with a bed sheet. Both bedding items I bought from the op shop a while ago (I was searching for a long time for a brown or orange blanket for Vincent and of course it wasn't until AFTER I made the kangaroo coat for him that I found like twenty of them). 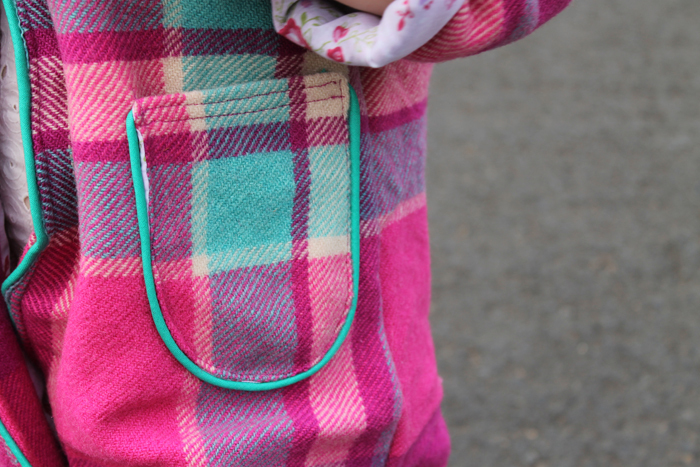 I piped the majority of the seams with my favourite colour, turquoise piping i made myself. I had a lot of fun matching up the plaids, it's my sick little pleasure. 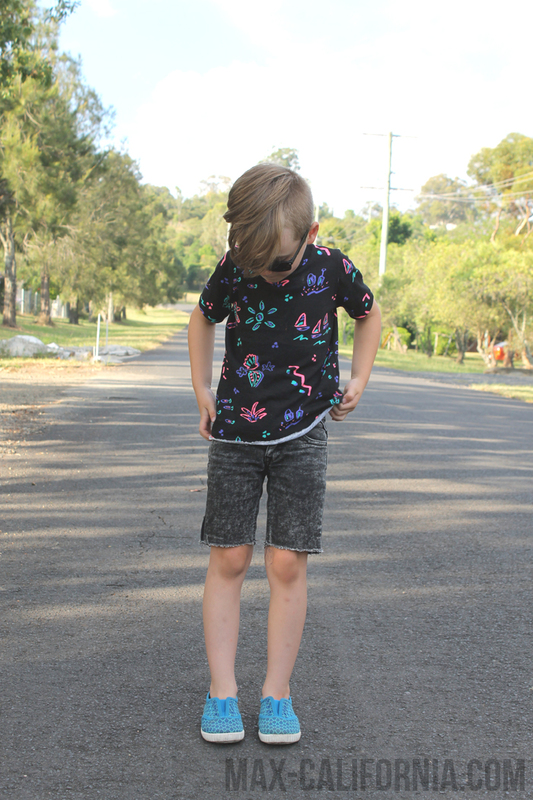 I sewed up the size three for my shorty, the pattern is designed to be worn with the cuffs rolled up with the idea of room to grow in mind! Don't you love that? 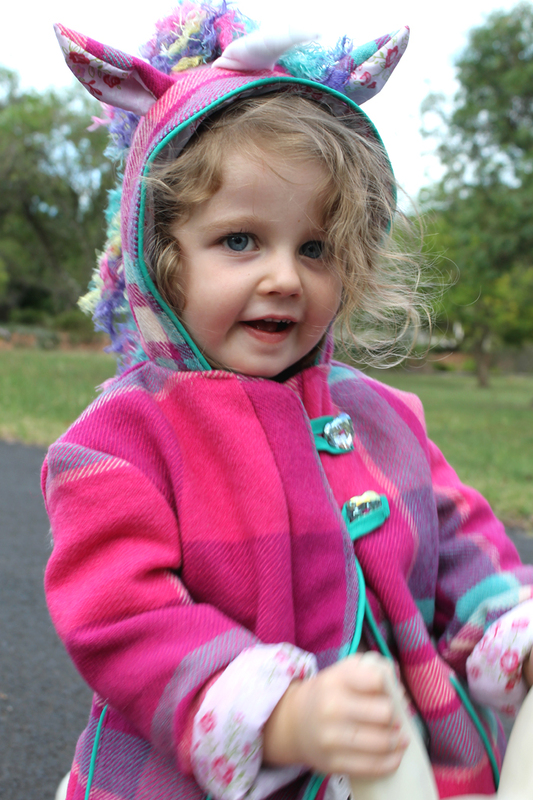 I've got the next two winter's coats sorted now! My babe loves it! Like LOVES it. Underneath she's wearing this little summer dress I made her two years ago that is like a little tunic for her now, and the flares I made last year for her. She's almost out grown them, it's sort of exciting because she didn't grow for such a long time haa. 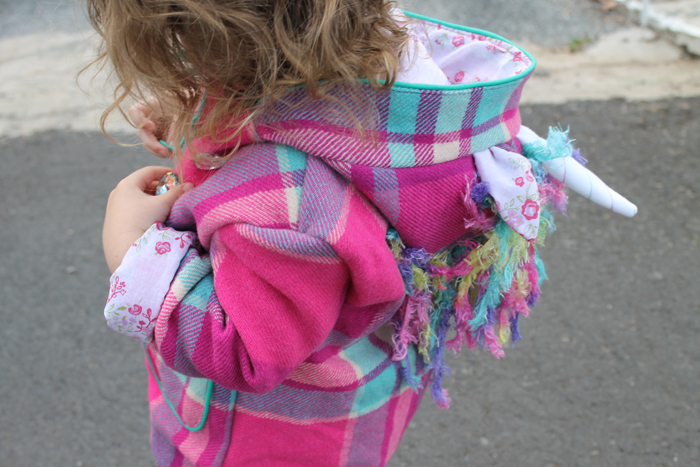 The coat is fully lined, so even if you are upcycling a wool blanket (highly recomended) it's not going to itch your little one at all. The hood is my FAVOURITE part. Okay all of it is my favourite part, but the hood was the most fun I've had. 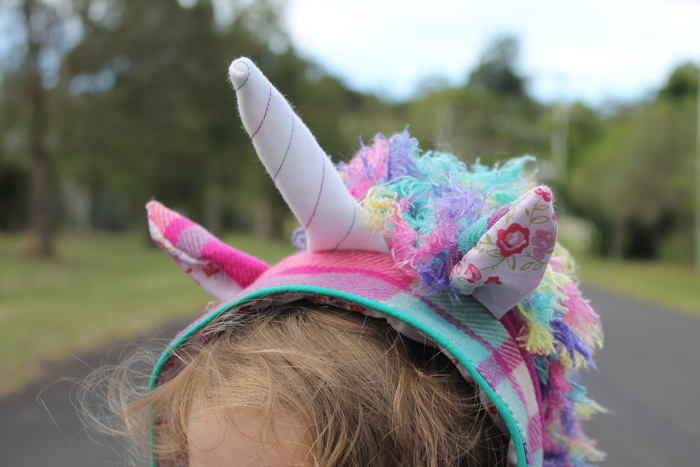 The sweet little horn is made from white fleece and with the diagonal stripes I alternated pink and turquoise stitching. The pattern gives you instructions on how to do the main, and I used rainbow wool I've had in my stash for a really long time. I really wanted to brush it out and get this effect, but I might do that later (i need to get a cat brush!). The little ears kill me, aren't they cute! But that horn. I'm in love with it. I was so intimidated by it but it's like the simplest thing ever so?? I get sewing hang ups on the stupidest things ahah. The buttons are also from my stash, something I've been hoarding but I'm glad I used them! Crystal-cut plastic buttons in the shape of hearts. So magical and so Eddie and she LOVES. 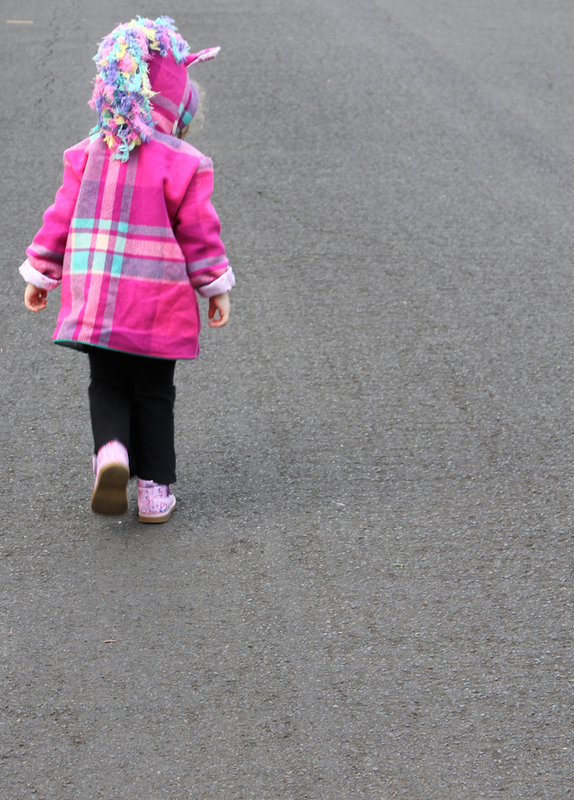 I have no idea what it is with toddlers and their inability to be affected by the weather. It was really hot that day and I was snapping pics so fast, it was like a five minute shoot and then she got rewarded with a big glass of water and a big bowl of ice cream with pop rocks. Eddie wasn't bothered by the heat, but Vinnie was. 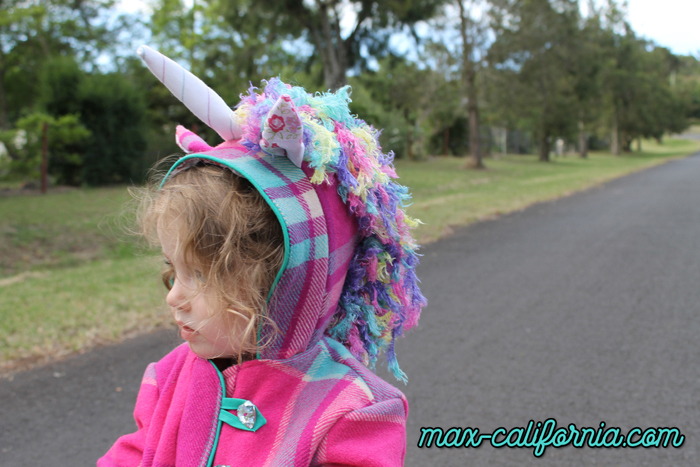 The hood is a small size, but you can use a larger sized hood if you prefer. If I made this again I probably would do that but I do like the way it sits snug around her adorable little cheeks. 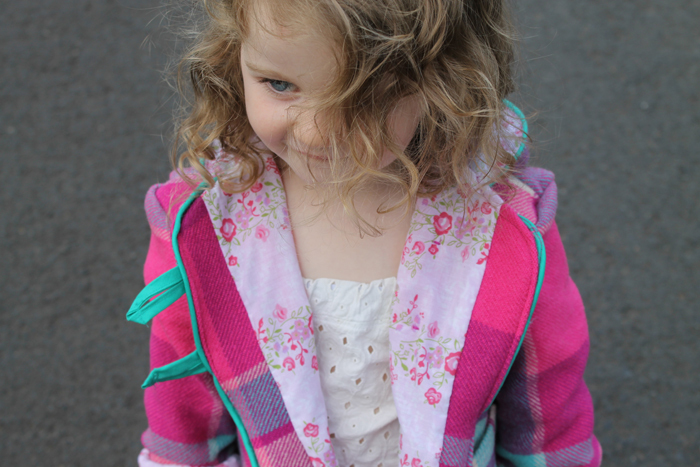 There is a blog tour for this coat if you want to check out all the variations! There's so many talented seamstresses out there who've stitched up some incredible little animals for their babes! My favourite is this dinosaur for an older boy (you know how I get heart eyes over boy things!). 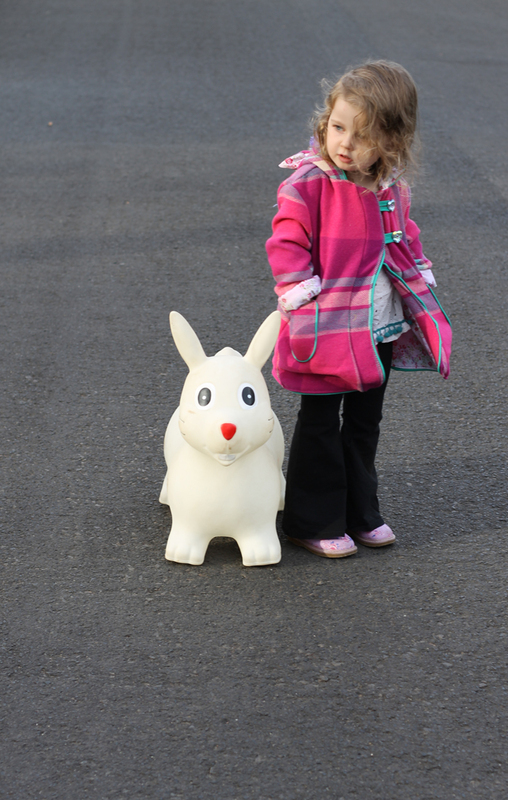 Vinnie's kangaroo coat will be up later this week for you! The boy is just obsessed with leggings, and skinny jeans, and if you live where i live that's just out of the question for summer. 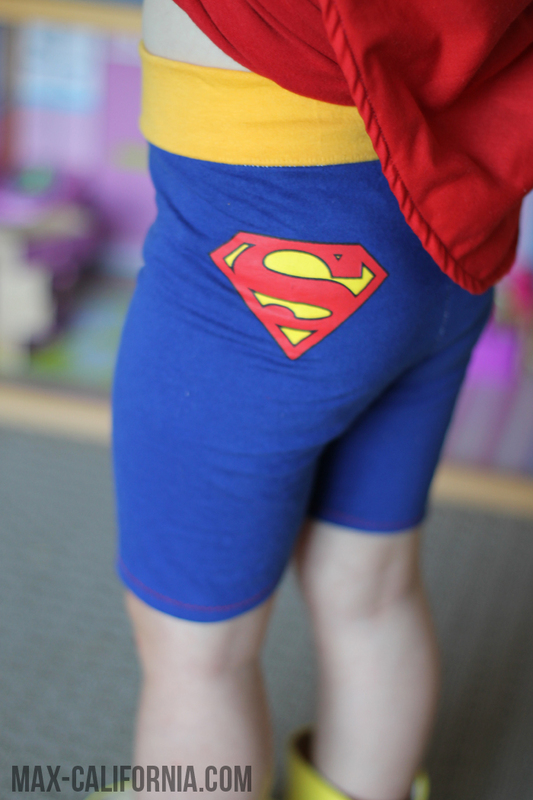 I make him a bunch of quick sew shorts, but I think i'm going to have to make him some more of the cake and less of the frosting when it comes to bottoms, otherwise he just doesn't match when he puts on his batman shorts with some crazy patterned tee! IE, he needs more basic staples that are sort of less fun to sew but probably will get WAY more wear! Those shorts he's got on he's had for years and he always wears them because they're skinny, but they're cool too. Anyway, this isn't anything that schmancy but this kiddo loves it. 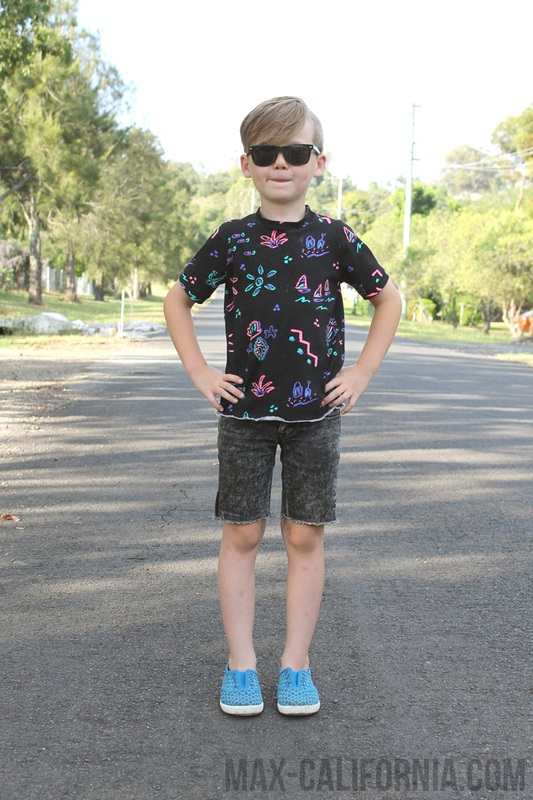 I sewed him up three basic kids tees the other night, all from fabric I scored at the op shop over the last year. 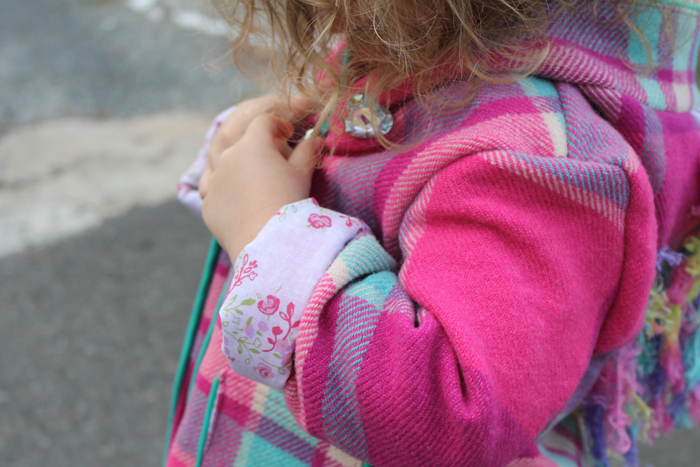 He chose the fabrics and I sewed them, which is the best way to sew for him. it's difficult though, he always wants t shirts made out of woven fabrics and I'm just like, dude that's not going to be so comfortable! We'll get there though, otherwise in 2016 I'm going to be making a helluva lot more button up shirts for him. The hem on this shirt is just overlocked, super lazy but he's not complaining :) he loves the heck out of this shirt so that makes me feel good! He's in grade 2 this year. I don't even know how to comprehend that. the sewjo has been severely lacking over here, but it wasn't until I went away on a much deserved beach vacation that i realised how useful it is to have all my fabric and sewing machines within reach! So when i returned I cranked out a few things, this request by Eddie being one of them! 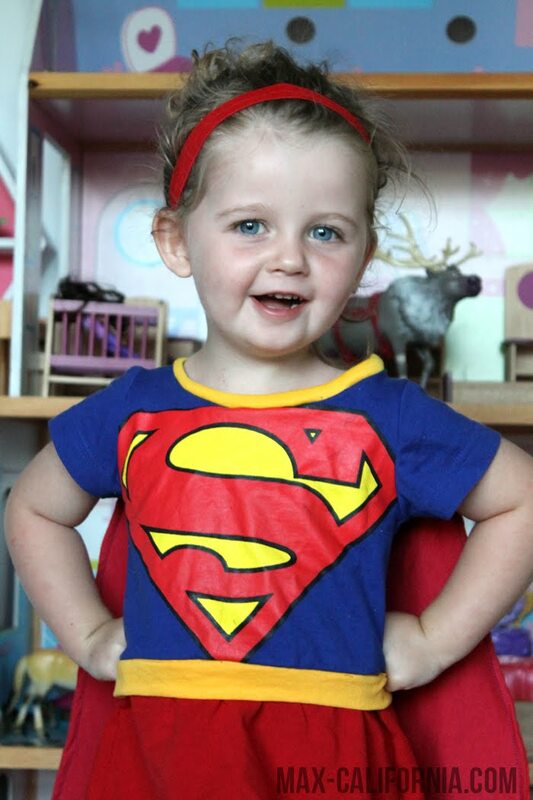 I love that she's old enough now to make her own decisions about what she wants to wear, what she would like me to make. 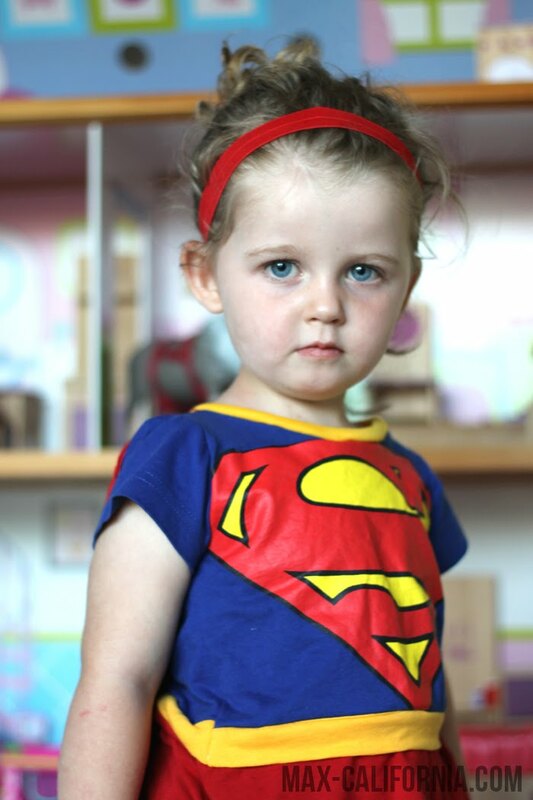 She insisted on a Supergirl outfit, for quite some time now, and so I pulled out a Superman t-shirt I'd got from the op-shop years ago and got to work! I love doing t-shirt surgeries, I love seeing how much of the original t-shirt I can use and basically I love upcycling clothing! 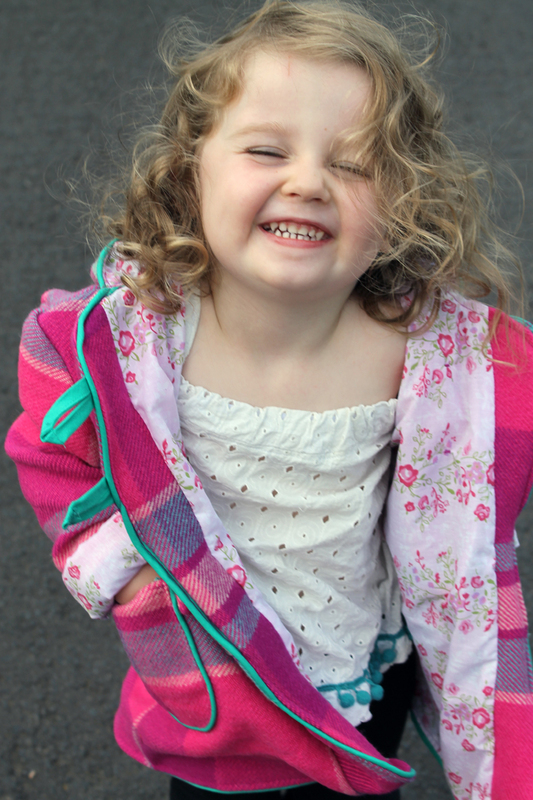 I used the Little Skater dress pattern by Kitschy Coo, a firm favourite of mine for sewing for the little girl. The sleeves of the dress are from the sleeves of the original t-shirt, so no hemming was needed there! I cut out a band of yellow stretchknit and sandwiched it between the skirt and the bodice pieces of the dress as a belt. The cape is two long pieces of red cotton, stitched together and then attached to the back of the shirt's shoulders and neckband. 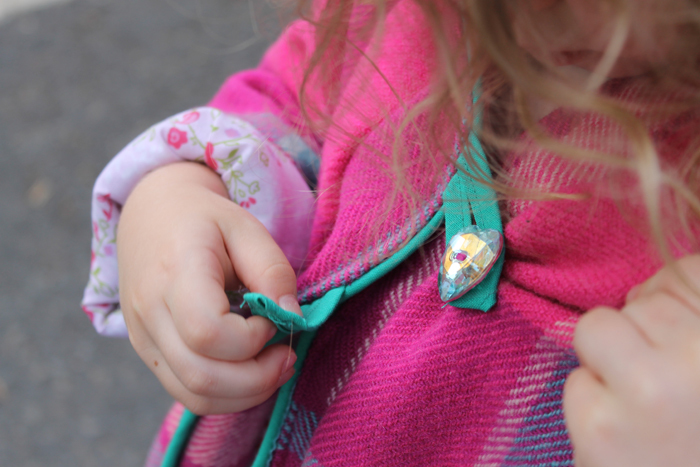 Just make sure when you do this that you use a really good stretchy fabric for the neckband, as the cape greatly reduces the amount of stretch in the neckhole - making it a little tricky to slip over little miss's head if it is too tight! Ideally the cape should be stretchy too but I was stash-busting and it seems I don't have as much red in the stash as I would like! How cute is this? 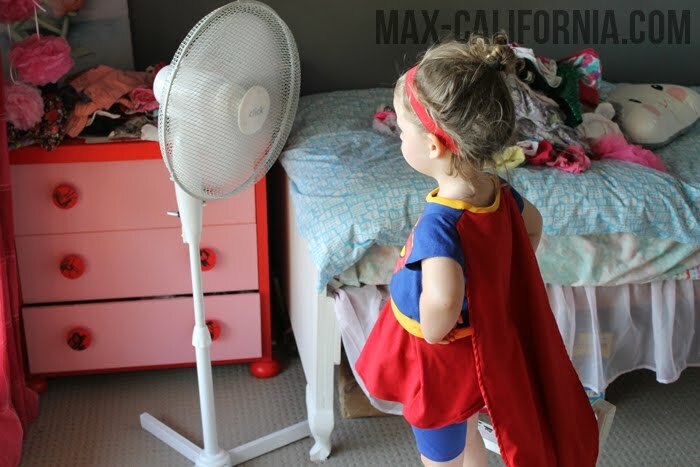 She was standing on a chair in front of the fan trying to make her cape blow out behind her. I used the shorts pattern that comes with the Clara by Violette Field Threads, and with the back piece of the original t-shirt I managed to eke out enough for some shorts to go underneath the dress! Some yellow stretch was used for the waistband - I really love how these turned out. 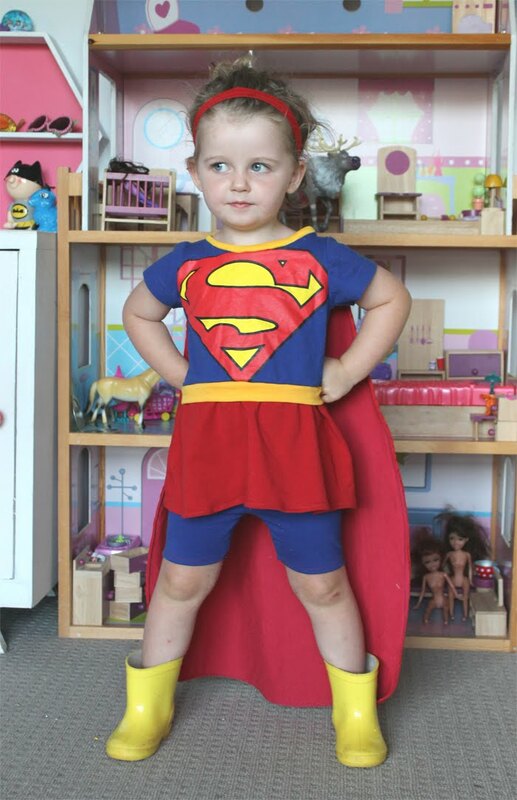 She wants a Wonder Woman outfit now, but it's pretty tough trying to locate the blue lycra with white stars! I really wanted to make it a swimsuit!